Location, super market next door with daily fresh bread, croissants, great fruit. Swimming pool if you did not feel like walking to beach. Friendly. Great for families! The facilities were ideal for a family. 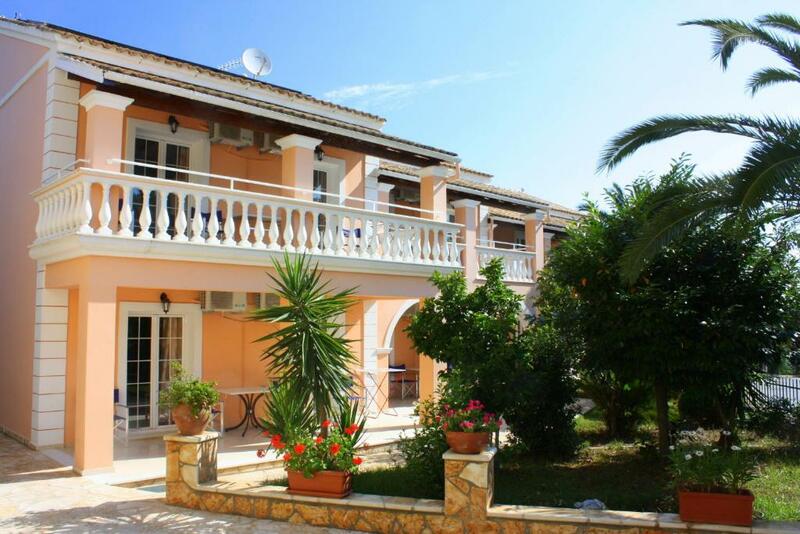 The apartment was conveniently located near kassiopi town and close to a lovely beach. The apartment was very clean and had everything you need to prepare food and drink. They were kept clean and the towels were changed on a regular basis. The Lea family were very friendly and helpful. The supermarket was next to us and there was a lovely pool. Really glad we chose family Lea apartments! We were in the superior apartment. It is huge, with a massive balcony, plenty of storage. The family are friendly and most helpful, and the adjacent store is well stocked and very handy, also open all day every day till 9 . It is within a km. of the port and centre. No need to drive in, lots of restaurants, we liked sousoura. Good value. 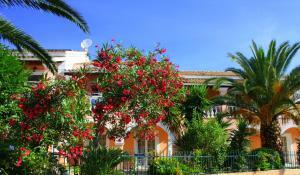 The apartment is in a good location with 15-20 minute walk into Kassiopi. Great balcony and the facilities were fit for purpose. The owners are very helpful and run the neighbouring supermarket, which is very convenient especially for fresh morning bread and croissants! Lea Family Apartments are lovely. We stayed in a two-bed apartment on the ground floor. Very comfortable accommodation; kitchen is furnished with everything you need; plenty of room and a lovely fridge freezer. Bathroom is great; plenty of hot water all day. Rooms are a very good size with wardrobes and drawers. Very nice pool area. Pretty garden to the front of the apartments. There's a barbecue which can be used by residents. The family own the shop adjoining the apartments. Great shop with lovely fresh produce. There's a taverna next door, which looks nice although we did not go there. Beach about half a mile walk down the road. Ten minute walk into the village. Will definitely go again. Maria and her family are very welcoming, rooms exceptionally clean with excellent facilities. It is great having the supermarket so close, ideal location, highly recommended and will return. We had a great stay at Lea Family Apartments. The apartment was spacious, very clean, had a big balcony with dining table, a pool and loungers and free parking. The location was great, walking distance to the centre of Kassiopi with plenty of restaurants and bars nearby. A supermarket owned by Lea Family was just 20m away from the apartment. The beaches nearby were crystal clear, unspoilt (highly recommend Avlaki beach). Lea’s family were very welcoming and friendly. We arrived late the first day (after midnight) and they were very kind to offer us snacks and refreshments. Overall my family and I enjoyed our stay very much and would definitely recommend it. We will be very happy to go back and stay at Lea’s. Great location, close to beach and town with 2 supermarkets and bars / restaurants close by. Lock in a great price for Lea Family Apartments – rated 9.1 by recent guests! One of our top picks in Kassiopi.Located in a garden with swimming pool in Kassiopi, Lea Family Apartments is 2,650 feet from Kogevinas Beach in Corfu. It features self-catered accommodations with free WiFi and a furnished balcony. Each soundproofed and air-conditioned apartment at the Lea is accessed via a private entrance and includes 2 bedrooms and a living area with a sofa and a satellite TV. The kitchen is equipped with a fridge, oven and dining area. Guests can relax in the free sun loungers on the terrace. BBQ facilities are provided in the garden for al fresco meals. A supermarket is 50 feet away from the property. The center of Kassiopi with restaurants and bars is within a 7-minute walk. Staff can arrange horseback riding excursions. Free private parking is possible on site. This property is also rated for the best value in Kassiopi! Guests are getting more for their money when compared to other properties in this city. When would you like to stay at Lea Family Apartments? Soundproofed and air-conditioned apartment featuring free WiFi and a furnished balcony. House Rules Lea Family Apartments takes special requests – add in the next step! Lea Family Apartments accepts these cards and reserves the right to temporarily hold an amount prior to arrival. Please note that extra beds are subject to availability and guests are kindly requested to inform Lea Family Apartments in advance if they want to use one. Kindly note that airport and port shuttle services with taxi or mini bus are available upon request and extra charge. Please note that check-in and key collection take place at: Kassiopi, Corfu 49081. Please inform Lea Family Apartments of your expected arrival time in advance. You can use the Special Requests box when booking, or contact the property directly using the contact details in your confirmation. It would’ve been nice to be supplied some loo roll and if there was some washing up liquid left. The work surface was a bit worn, cooker ok but old, no microwave, though not missed. The beds were as hard as nails and squeaked whenever you turned over. The pool area is very "compact" and sadly suffers from regular traffic noise at a busy road junction. The TV signal is hit and miss and unit is not located conviently so didn't use it hardly. Cooker was old and didn't heat up very well. So couldn't really use it. Could just about boil pasta which took a long time. The pool was spotlessly clean but very small. Any more than 6 people in the pool would have been uncomfortable. Cooker could probably do with upgrading. Occasionally noisy as road outside could be busy but OK. Apartment was great, spotlessly clean. Aircon worked really well. Bedrooms spacious as was balcony which we appreciated. Building itself lovely and airy and small number of apartments made it feel more so. Supermarket next door, really convenient. Fresh baked spinikopota and croissants added bonus (good meat section too!). 15-20 minute walk to Kassiopei so good location.